A week ago we added a few “simple” changes, that may help you a lot in keeping your final photos organised. In the following I will show how you can use these new features. You select a directory to output to, and a filename template, the defaults are using the filename for the camera as a base, and adding a counter for each export. Pretty basic, and good enough if you prefer your images in one directory. The rest are the output file settings, which I will not go deeper into here. In the following I will shortly explain the new filename template features and how you can use them. A new feature is that is actually a quite big change is that you can now use subdirectories. The major change is that if the output directory does not already exist, Rawstudio will now always attempt to create them. This means that you can have Rawstudio create the folder structure for you based on metadata. An important modifier is “%p” that will insert the original path of the processed image. 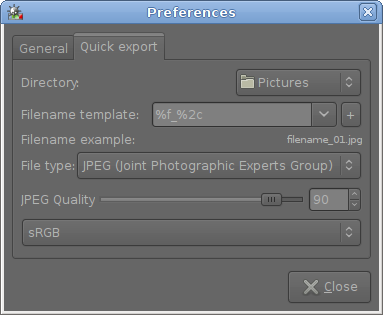 This means that if you use “%p/%f_%2c”, your image will be placed in the same folder as the original image. You may note that the directory you choose in the selector, will not be used for anything. You can of course do variations, so “%p/converted/%f_%2c” will create a subdirectory called “converted” inside the folder with your raw images and place your converted images there. A simple example for this is “%DY/%DM/%f_%2c”, which will create a folder with year and month (Eg. “2010/April/IMG_0987_01.jpg”). The folder will be based on the date from your camera, so if that is correct, you are good to go! A slightly more advanced filename template for this could be “%DM %DY/%DD %Dd, %t (%f_%2c)”. This will create folders for each month (Eg. “July 2010” where it will place images with file names based on the dates, like “Monday 21, 12:45:01 (IMG_7325_01)”. This may be a little over the top, and slightly impractical, but you can of course adjust this to your personal preference. 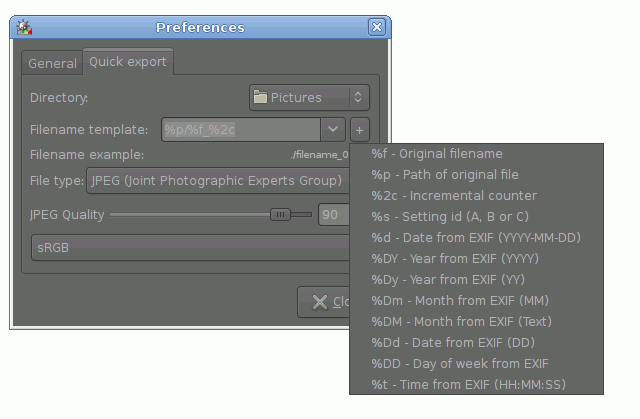 The screenshots above are based on the “Quick Export” settings, but it also applies to Batch Export, where the exact same templates can be used. If it’s of any interest to you, I split up my photos in two different directory trees: photos-[year] and edited-photos-[year] below which are identical directory structures. These are main categories such as family and friends, events, nature, portrait sessions etc., and again these are divided into e.g. specific shoots, our kids’ birthdays, trips abroad etc. This has the advantage of dividing things up so that it’s easy for me to copy the relatively few gigabytes of processed images I accumulate in a year without needing to filter out the many tens of gigabytes of source material. I don’t think my system will be easy to accommodate, nor would I expect you to try. These new improvements might persuade me to organise differently next year, but we’ll see. That was the deature I missed most! Thanks, that’ll make keeping my harddisk tidy easier! It would be nice to have a control of more pro JPG settings, like subsampling. A nice-to-have. I believe libjpeg automatically en/disables it around quality 80 IIRC. For pro usage, TIFF or PNG would probably be preferable anyway. But I’ve added a bug to remember this.